"Love me, love my vote." 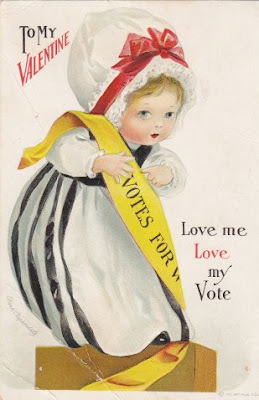 That was the phrase of the day for February 14, 1918, Valentine's Day 2 years before American women achieved the right to vote by dint of the 19th Amendment to the Constitution. It appears, however, that the artist hedged her bet: this site attributes not only the Valentine at left, but also another, which declared "Woman's sphere is in the home," to the same year and the same artist, Ellen H. Clapsaddle. Born in 1865 in New York state, Clapsaddle was among her era's most popular card illustrators. Yet she "died penniless" in 1934. As for women's rights and Valentines, illustrators seemed to play both sides of the divide. (See here, too.) And pro-suffrage activists back then used the day to push for voting rights.